FSU’s underclassmen face tough decision – stay or go? 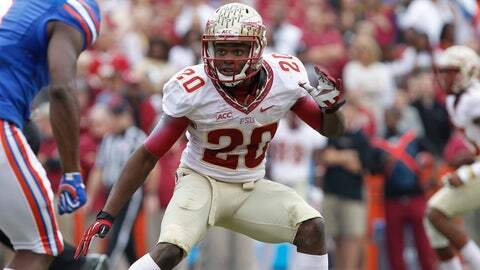 Lamarcus Joyner decided to return to Florida State for his senior year, and he earned All-America honors at cornerback. TALLAHASSEE, Fla. — Jimbo Fisher can only dream of what Florida State’s team would look like in 2013 if it hadn’t lost a few players early to the NFL Draft. Of course, it also could have been far worse if linebacker Christian Jones and cornerback Lamarcus Joyner had opted to leave early instead of staying in Tallahassee. While the salary cap and free agency often rob NFL teams of talent and create parity, college football programs also face the tough task of trying to ”recruit” their top juniors to bring them back to campus — and potentially pass up millions — for another year on campus. This is the debate facing a group of Florida State juniors, including defensive tackle Timmy Jernigan, left tackle Cameron Erving, wide receiver Rashad Greene, tight end Nick O’Leary and three tailbacks, Devonta Freeman, Karlos Williams and James Wilder. A redshirt sophomore, wide receiver Kelvin Benjamin, is also eligible to leave early if he chooses. Jernigan and Erving are projected as first-round picks in many early mock drafts. For the other player, the temptation to leave will be there but also with a healthy dose of uncertainty. Fisher has a simple philosophy. He wants his players to get the right information. Every junior or redshirt sophomore has had his information submitted to an NFL advisory committee, which reviews game film and evaluates players. The committee gives a recommendation on where a player would be picked if he were to leave early. Then it often gets complicated because of agents and dollars. ”Everybody wants to make a dollar off of them,” Fisher said. ”Everybody is going to tell them what they want to hear. When you’re a player, sometimes you hear what you want to hear. The key is who you trust and keeping that circle tight, and make sure you get the proper information so that you can make the proper decision. Fisher is right to a certain extent. Few agents have the ability to manipulate an NFL general manager, to entice him to pick his client instead of another athlete. In the end, the game film, NFL Combine interviews and on-campus Pro Days are far more influential. Florida State lost three juniors off the 2012 team. Defensive end Bjoern Werner (Indianapolis Colts) and cornerback Xavier Rhodes (Minnesota Vikings) both were picked in the first round, while offensive lineman Menelik Watson (Oakland Raiders) went in the second round. As much as Fisher would love to have had those three in 2013, Florida State went 13-0 without them. And he was happy to see those juniors realize their dreams of playing pro football. Sometimes what’s best is staying and improving the resume by playing a senior season of college football. Two players that returned for 2013, Joyner and Jones, have likely improved their draft stock. Joyner said in the preseason that he would always be 5-foot-9 no matter how good he was at safety. So he wanted to return to play cornerback and give NFL teams something to think about. Joyner had 54 tackles, five sacks and two interceptions and was named a unanimous All-American. Yes, Joyner is 5-9, but he’s versatile enough to play multiple positions in the defensive backfield. The decision to stay has paid off for Joyner, and he’s willing to offer up advice to his teammates that are weighing their options. ”We should take care of this championship and then after that they can think on that,” Joyner said. ”But at the end of the day, this is a great organization. I’ve been in their shoes before, I believe that you shouldn’t rush anything in life. Do the best you can and let the chips fall where they may. Jones was Florida State’s leading tackler (95) in 2012. But he was asked to move to a hybrid role, one that often has his hand on the ground as a defensive end. And Jones has 49 tackles, two sacks and an interception. And, of course, Jones hoped to pursue a national title in his senior season. While he could be in the NFL right now, earning a paycheck each week, Jones also knows that he has a chance to do something special when Florida State plays Auburn on Jan. 6 in the BCS championship game.